Jasa Pelangi Express 10:05 AM (10:05) Pickup: Kuala Terengganu (MBKT). Bus from Kuala Terengganu to Kuantan is very a popular selection of bus route by locals to travel between two cities. Many travellers rely on the direct bus services from Kuala Terengganu to Kuantan because of comfort and low cost. Kesatuan Express, Perdana Express, Maju Express, Transnasional are few bus service companies providing daily bus from Kuala Terengganu to Kuantan. Transnasional is larger operator among them by providing more frequent schedules in this route. They provide 4 to 5 daily departures depending on the day. During weekend, Transnasional will provide 5 schedules while they provide just 4 schedules during weekday. The first bus starts operating at 9am while the last bus leaves the MBKT Bus Terminal at 10:00pm. All operators are operating this route with VIP 27 seater coach to offer comfort for passengers during the journey. The duration required for bus from Kuala Terengganu to Kuantan is about 3.5 hours, depending on the traffic and weather conditions. Washroom break will be given upon request from the driver during the bus journey. 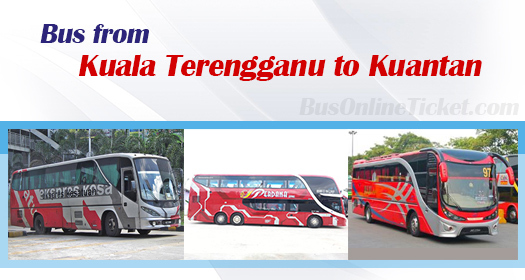 There are adult fare and child fare for bus from Kuala Terengganu to Kuantan. The adult bus fare for this bus route is at about RM 19.50 while the child fare is at discount fare of RM 14.70. The departure point in Kuala Terengganu is MBKT Bus Terminal and the arrival point in Kuantan is Kuantan Sentral Bus Terminal locating at Indrea Mahkota. Book your bus from Kuala Terengganu to Kuantan online now with BusOnlineTicket.com, a secured and trustworthy one-stop online ticketing portal. By booking your bus ticket online, travellers can save time and effort from going to the ticketing counter just to buy a ticket. We accept various type of payment methods, including credit cards, Paypal, Singpost, Alipay and many more.